This event will take place on Saturday, October 16th at 8:00 p.m. For more information select this link. For a full listing of parade entries select this link. PRINCE EDWARD - Wanted: historical floats, churches, schools, girls and boys clubs, singers, representation from agricultural interests, marching bands and more to participate in a Prince Edward County's 250th Anniversary Commission parade. Sponsored by Haley Automotive of Farmville and Tri-Boro Shelving and Partition Corp., the one-time only event will be held Sunday, May 23 with the theme "Pride in Prince Edward." "We are trying to have a historical parade but, at the end, we hope to have some modern (entrants)," explained event chairwoman Dolly Childress. From vintage farming tools and period costumes to more modern examples, parade organizers want to have entrants representative of the 1700s, 1800s, and 1900s to the present. Ms. Childress is even working on having an ox to walk the parade route and someone in costume to represent Prince Edward, the English prince for whom the County is named. A committee of community volunteers has been working on the parade, one of five major events commemorating the County's historic birthday, since last summer. It will event that that will celebrate the County's rich history and accomplishments. So far, organizers have about 20-25 entries, but they hope to see that figure grow. (There is no limit.) Antique fire trucks and other period "classic" automobiles are expected to be part of the event; organizers hope to recognize soldiers who have returned from the Iraq war and would like to see a march of veterans of other wars; and the parade committee is planning to recognize County residents 95 years and older as one entry in the event. And, yes, organizers are seeking to have a batteau-minus the water, of course-to make its way down Main Street. "I don't want to turn anything down if it'srelevant to the theme of the parade," says parade committee Jennifer Townsend. There are a few things still on the wish list, however. Both vintage Union and Confederate reenactors are wanted, as well as marching bands (including those from schools outside of Prince Edward) and someone to offer vintage fife and drum music. "I think it would be wonderful to have participation from Hampden-Sydney and Longwood," Ms. Townsend said. Entrants (there is no cost participate) will be judged based on the Century they represent and historic representation. Other judging categories include band/musical; marching unit, float, and equestrian. Entry forms are available by contacting Ms. Childress at 434-248-5476 or 250th Anniversary Coordinator Betty Robb Breen at 434-392-8837. Forms must be received by April 16. PRINCE EDWARD - Children across the County will preserve a slice of Prince Edward County history and make a little bit of their own. The County's celebratory 250th Anniversary Commission-a culmination of weeks of work by local youths-will hold a Children's Creative Exhibition of art and literary talents April 30-May 15 at the Longwood Center for Visual Arts celebrating the theme of "People and Places of Prince Edward County." "It's going to be, I think, a combination of social studies and art projects where they learn about their County through this 250th birthday," explained Denise Penick, Museum Educator for Longwood's Center for the Visual Arts, who is heading up the art portion of the exhibit. She added that it's going to give children an "opportunity to learn about their history, I think, more so than they would have otherwise." Some students will show an interest in the past in their work. Some will likely see the rural part of the County. Some may even look to annual events like the Five County Fair or Heart of Virginia Festival. "I hope, also, that they will focus on their family unit as well and what life is like for them today," Ms. Penick said. The writing contest will feature the work of students from grades two through 12. The work may be prose or poetry and could include letters, essays, short stories or diary entries. "We really want to encourage all students to participate," commented Jill Dickerson, the 250th Anniversary Commission's Program Chairwoman who is also heading up the writing portion of the contest. "The whole purpose is for them to learn something about the Prince Edward County history and there's a lot of it-there's a lot of good history for them to learn about. Something that would interest everybody from Indians to Civil War to just about anything, business." Winners will be selected in three categories: students in grades two through four; five through eight; and nine through 12. First place winners will receive a cash prize of $100, second place $50 and third place $25. The works of first place winners in each of the age categories will also be featured in the Herald. The art contest will be open for children from kindergarten through grade 12. Prizes will be awarded for grades K-2, 3-5, 6-8 and 9-12. First place winners will receive a cash prize of $100, second place $50, and third place $25. All contest winners will be recognized in the Herald. Ms. Penick is anticipating a lot of narrative artwork where the children tell a story in a scene in many different media. "I think that we'll be really pleasantly surprised at the depth, their sense of their community," Ms. Penick said. "It'll be enjoyable to somewhat see how the events in Farmville unfold through children's eyes." Art teachers in Prince Edward County Schools and Fuqua School will be asked to limit the number of works submitted between 25-100. Those works, as will select writing entries, will be on display at the University's Visual Arts Center beginning with an opening reception April 30, from 5-7 p.m., through April 15. Other entrants are expected to have their works displayed in schools or at other locations in Farmville. The event is sponsored by Haley Automotive of Farmville and Superior Mortgage Corporation. Members of the PR committee for Prince Edward County's 250 Anniversary Celebrations modeled commemorative items that are now on sale. 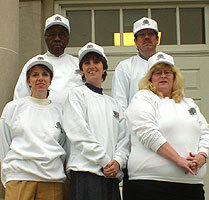 Pictured are the chairman of the commission Lacy Ward, Co-ordinator for the celebrations Betty Robb Breen, and several members of the PR committee wearing commemorative caps and sweatshirts. Also available will be t-shirts, note cards, and mugs. The items are currently on sale through the County Administrator's office. Contact Betty by email at info@princeedward250.org or phone (434) 392-8837 for more details. The items will also be available for sale online through this website in the near future. All items bear a version of the county seal specially commissioned for the celebrations.